Rig was K2 to 100' wire at 40'. Kinda slow going early on. I began calling on 20 at 0200z but got no answers. Moved to 40, but got no answers there. Moved back to 20, but no answers. Then back to 40 and finally got the first answer at 0209 from Alan, KB7MBI, way out in WA. Could spend only an hour on the test and ended up with 10 contacts, all on 40. SPC's were WA, NY, VA, OH, IL, CA, PA, MA (2), WI. The band seemed to be in pretty good shape and noise was not bad. WA8PGE was running all of 750 mW but had a pretty darned good signal. If you did not get in you missed a good evening of playing radio! The evening started out with a bang then seemed to really die down for the last half hour. I decided to run QRPp, running Vectronics TX and Softrock RX, 750 mw to an inverted vee. Laptop was running Rocky. My TX was semi-rock bound (XCO), from about 7.039 to 7.040 so I couldn't work stations on the other side of 7.040. Thanks everyone that picked my signal out of the mud! Best DX from Ohio was WB5BKL, TX 1,077mi. Had lots of fun!, will try 500mw next time! K3/10 @ 5W to a 40m extended double Zepp. Not one of my better outings. Tried 15m briefly. Most of my Qs were on 40m, but did work K4ORD and K4BAI on both 40 and 80m. Nothing after 0330z. My first QSO was with WA8PGE who was running 750 mW - that's better than 1,000 miles/Watt by my calculation. Worked another station at 1 Watt. All the other Stations were at the 5W level. Had fun. Conditions were fair tonight, 40 was noisy with lots of digital noise the first hour. made 16 qso's on 40M and 5 on 80M. Thanks to all. FT1000MP, 5W, TH6DXX, dipole, inverted vee. Band conditions pretty good on 20, 40, and 80. Activity almost NIL. I think some of the problem may be in log submission difficulties that must be running off participants. The link from the webpage for "log submission" no longer works and takes you instead to last month's results. 20M was wide open with very strong signals from W1AW, west Africa, Central America, and much of the US, but only NQ2W and I seemed to know it. One QSO on 20M. 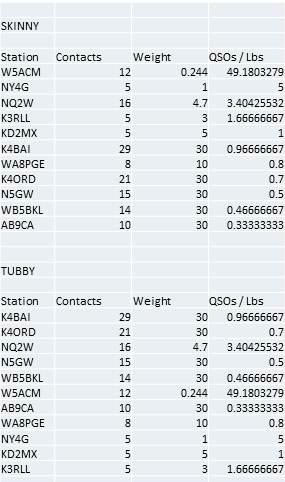 40M was open to most of the country, with stations as close as VA readable in GA. Best DX was KD6L in CA. 15 QSOs on 40. Heard no activity around 7030 kHz this month. 80M was open to the whole country with best DX being W7GB in WA. 13 QSOs on 80. Hope for more activity in next month's Spartan Sprint. Could not find many sprinters tonight. Rig was a KX1 and AA batteries. Maybe my KX1 will have better luck next time. I was skunked. Started on 20m. Band was dead. Listened on 40, but could hear no Sprint activity. Went down to 80. The noisiest I've heard 80 in quite some time. Went back to 40. Still no Sprint station heard. Gave up and tried to work HU2DX. Called several times. Nada. Hurry up March! My ATS-3a is STILL on the workbench, but I did find time after the event to isolate the problem in my favorite two-ounce radio. For this Spartan Sprint, I once again used the heavier ATS-3 in the Altoids box. I found 20M dead, but 40M sounded quiet, almost too quiet. I had a surprising number of contacts with NY and MA, with only one station to the west. QSOs from the Midwest and Southeast were typical, and greatly appreciated. The three 300 mAh LiPo batteries really took a beating as I parked on 7040 and called CQ. But it was worth it. I had to shut down half an hour early to avoid killing the new batteries, but it was nice to get a decent number of contacts - an even dozen! Hoping for better conditions on 20M next month! I was mostly just listening on 40M while working on the build of my new G11 SDR. I heard WA8PGE with a great signal running 750mw so I had to jump in. FT897/5W to my all-purpose loop. A newly built K1 running 5W to a mini-beam at 25 ft for 20 meters, an inverted vee at 40 ft for 40 meters, and ground mounted, near bottom-loaded vertical for 80 meters. Worked K4BAI on 20...only station I heard there. Went to 40 and worked K4BAI again whilst he was in a pile up...proceeded to work 13 more FB QRP stations on that band. Switched the filter board and went to 80 meters and worked K4ORD - second band - but the only sprinter I heard on that band. I was hopeful for more activity on 80 but it just wasn't there...maybe next month. The K1 performed well...the band conditions were up and down with QSB...thanks for all of the repeats...the filtering didn't get a real test or maybe it did because there wasn't a lot of QRM. Thanks to all of the participants and thanks to the organizers. Hope to hear you all again and more next month. Rig was a 40M HB one watt vxo tx from plans by W1FB (2N2222 vxo driving MPSU02 class A) into HB balanced Lnet tuner to CFZ. LIstened on an OMNI V. Band was quiet. It was fun. 40 meters sounded reasonably good with a minimum of digital QRM, but didn't hear many Sprinters. Oh well, someone has to come in last.